The Grand Tour is a complete trip to Morocco. Discover Casablanca, Marrakech, Sahara Desert, Fez and Chefchaouen. 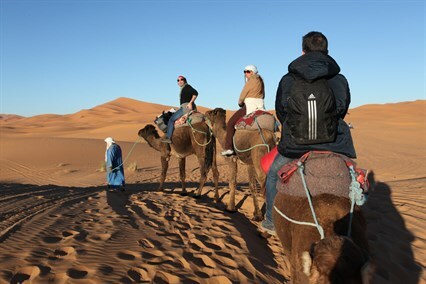 The Grand Tour is a 7 to 9 day trip through Morocco that adapts to the traveller, starting and ending in the main cities of Morocco (Tangier, Casablanca, Marrakech) or Spain (Tarifa) to facilitate access to and from the country, either by plane or boat. Marrakech, "the red city", lets you be carried away by its aromas, colors, customs and traditions, in a tour of its medina to which Unesco declared World Heritage. Live the experience of the Sahara and feel like an authentic Berber sleeping in a tent and walking on the back of a camel, through the dunes in the middle of the night, to see how the light of dawn is painting the desert with colors you have never seen before. Chefchaouen, 600 m above sea level, in the Rif mountains, is a village of traditions, tranquillity and mystery. Called "The blue city" it is unique in Morocco for the color of its houses that runs through the streets transmitting to you a serene feeling. Its difficult to forget markets announce their products by voice, the smell of spices... submerge yourself and feel one more. If you want to know more about travelling to Morocco with the Gran Tour, call us at 954 224 241. GRAND TOUR TO MOROCCO FROM MARRAKECH TO FEZ. In the great 7 days Morocco tour you will discover magical places like Marrakech - Ait Ben Haddou - Ouarzazate - Tinerghir - - Merzouga Sahara - Ifrane - Fez. GRAND TOUR TO MOROCCO FROM MARRAKECH TO TANGIER. Discover on this 8-day trip the best of Morrocco. GRAND TOUR FROM CASABLANCA TO TARIFA. The Tour where you can discover the best of Morocco 7 nights touring Casablanca - Rabat - Marrakech - The High Atlas - Aït Ben Haddou - Ouarzazate - Tinerghir - Merzouga (Sahara) - Erfoud - The Middle Atlas - Azrou - Ifrane - Fez. GRAND TOUR OF MOROCCO FROM TANGIER TO TANGIER, 9 DAYS. Do not miss this magnificent trip to Morocco. You will know the most interesting destinations with this tour, Casablanca, Marrakech, Sahara Desert, Fez and Chefchaouen.